The plan was set into action. I had told my husband a small lie (but a lie all the same,) that I would be getting up earlier than he was to get used to being on a schedule again. 8:00 am rolled around and I snuck out of our room, stealthily grabbing my tennis shoes and clothes before quietly closing the door. I changed, grabbed my phone, wallet, and purse, and left a note for Ian. On a neon sticky note, stuck to our black table, the note read: "Ian, Gone to buy milk. Be back soon. 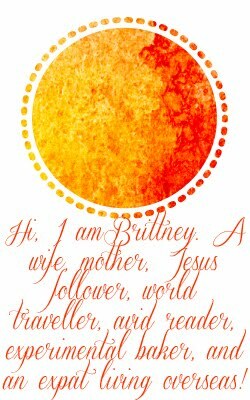 Love, Brittney"
Only instead of Ian, I wrote his nickname, so that he would know I did not write that note under duress. And don't ask me what his nickname is, it's a long story that I'm not even sure I know. I high tailed it the 3 blocks, in the rain, to our local Tim Hortons (like a Dunkin Donuts but WAY better,) ordered an assortment of pastries and a Decaf Double Double (2 creams, 2 sugars,) and scurried back home. About 50 yards away from our front door, my phone rang. It was Ian. All freshly awoken and very confused about my where abouts. Turns out that carefully constructed note got blown off the table by the fan. Ian was just happy I wasn't another Saturday morning kidnapping victim. We spent the morning, cuddled on the couch, watching Friends episodes, or laughing hysterically at the train wreck that is The Real Housewives of New Jersey (my guilty pleasure- Ian can't believe that these people are real- hello, it's in the title of the show!) eating muffins, danishes, and bagels. Not much planned for the day, but we're okay with that. Maybe tomorrow we'll go somewhere, or do something. But today, with the rain coming down and that cool Canadian breeze blowing in our windows, we'll stay right here, happy to be together. What a fun beginning to a wonderful weekend!! what a perfect way to spend the day!! Sounds like a lovely Saturday morning!